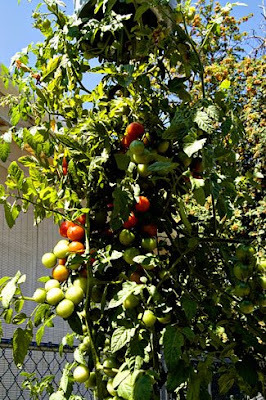 A Taste of the Earth: why hang tomatoes upside down from buckets? For starters, there are no weeds. At this point in the sales pitch from the Handyman, I was sold. No weeds sounds fantastic, doesn't it? 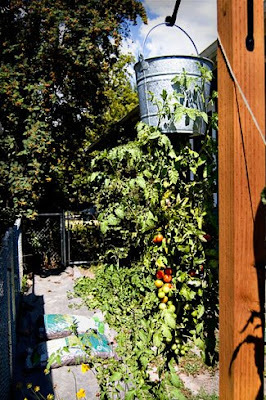 The downside to that is that you're going to have to hang your buckets somewhere, and somewhere needs to be sturdy enough to hold a bucket of dirt, water, and some big, juicy, tomatoes. 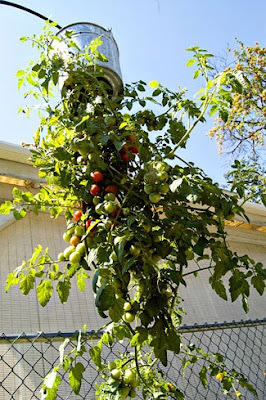 Somewhere will need some extra work to make sure that your tomatoes don't rip a a tiny corner off of your house or tip a post over onto your prized roses. So you won't be spending time weeding or mulching, but you're going to have to get out some tools to secure those suckers. How big a bucket should you use? We use 3 gallon buckets. An autopsy of last years buckets (same size) revealed that the roots barely take up a quarter of the space. I have no idea if you'd be better off going bigger or smaller, but we're digging the size we use. This year there are TWO plants in each bucket. The Handyman has all patio princesses, and I've got four princesses, two gardeners delight, a tumbling tom, and a yellow pear. Their fruit, though, is much bigger than we expected. So while there are many more cherries on the others, these princesses are putting out plump, bigger-than-golf-ball-sized tomatoes. We'll need 'em big because we've got 36 health kick hybrids in the community garden plots that are struggling to turn red, too, and my little heart is set on some sauce. Okay, but I digress. 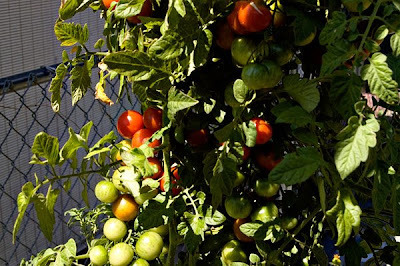 We're talking benefits of hanging your tomatoes. How about I just list them? 5) Makes more space in your garden for other things, especially in raised beds. 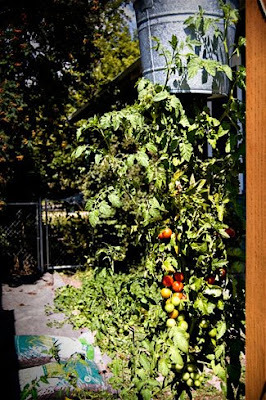 The best reason I can give for hanging your tomatoes (or any other vegetable) is that it's fun. It's gardening up in the air where you usually don't garden. 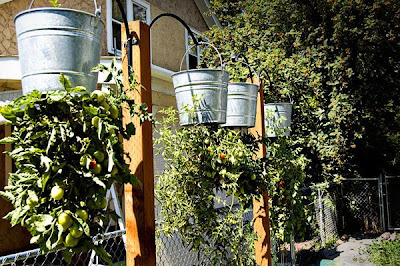 Hanging veggie buckets make people do a double-take when they stroll by your yard in the evening, expecting to see petunias or osteospermum or lobelia trailing down from up high. Sorry, but this is where the photo shoot ended. I started eating, and before I knew it, all the red ones were in my belly. Upside-down or right-side up, they do all taste the same! Though much of the information in this post has been mentioned in the earlier ones, there are other posts on upside down tomatoes - with different pictures. There's even a step-by-step of one way to put your buckets together. Just click the button on the right, and you'll get a list of 'em! If you've got something hanging in your garden, do comment so everyone can go see your pictures! I would love to do this and am adding it to my spring gardening list for next year! They are really doing well! The buches of tomatoes are just amazingly huge. Do I see some tomato tarts in your future? I've read back through all the posts on your upside down buckets... I admit readily that I am just as much about the way things look as having the fun of growing vegetables. This method of growing has never intrigued me until I perused through your photos and the step by step design. Your tomatoes are looking terrific. 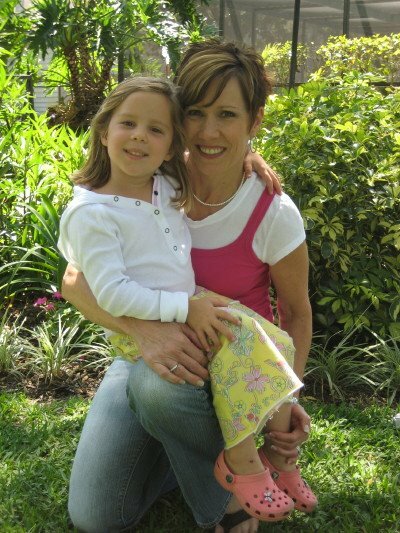 Mine are long gone in the Florida heat but I have some seeds growing now for my fall harvest. There are several aspects of this method that seem advantageous even over my raised beds. 4. 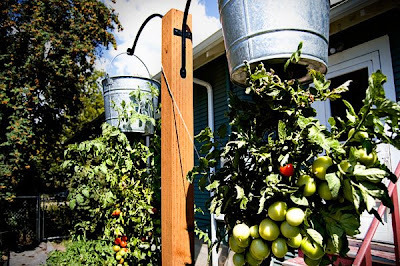 When tomatoes aren't growing hangers could be used for hanging flower baskets. Given the height of those gorgeous tomatoes do you have a problem with the birds thinking they've been planted for them? I'm thinking you only hand water as an auto irrigation wouldn't reach. Anyway, have enjoyed your blog... your writing style and your photos. Hey, thanks for answering my question. Good answers, too! Great blog. I love all the photos and info! I'm adding you go my gardening blog roll! 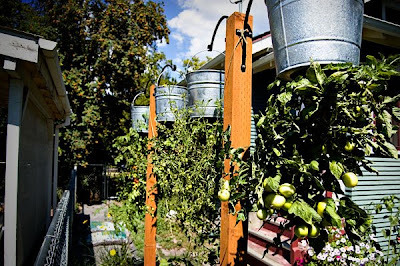 After researching these upside down tomato planters, I have to wonder if you've ever tried to use one of the commercial planters in comparison to your homemade planter. Perhaps they both produce an equal tomato product. But if that's the case, why wouldn't more people use the home made methods? I'm just wondering if anyone has ever done a little scientific test to see which one works better. Thanks for posting this! I have two questions: How tall are the 4x4 posts? And where did you get those adorable brackets? Has anyone tried using more than one plant per bucket? I am going to try and go with 4 plants per bucket. Any reason not to do it? I do handwater, but I've never had trouble with them drying out even if I miss a day or two. A weekend away is definitely possible with buckets - at least here in the mid-nineties. I want to say that the posts are 6' tall and the hooks came from the Lowe's. We've done one plant per bucket and two plants per bucket - I think we'll stick with two just based on root space. I should try those metal buckets too.